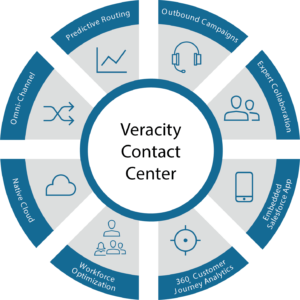 Transform your contact center into a strategic asset utilizing Veracity’s omni-channel predictive analytics, connecting your customers with the best available agent, lowering operational costs and improving customer service. Outbound Campaign Manager automates outbound calls for sales and marketing. Expert Collaboration and Communications utilizes embedded voice and chat capabilities through on-demand collaboration reducing first-contact resolution time, while enhancing the customer experience. Enhanced Sales Force App catapults your CRM beyond standard screen pops. Navigate CRM data to provide agents rich contextual information for each customer interaction. 360 Customer Journey Analytics link and analyze the customer experience at each stage of the journey to improve customer service. Workforce Optimization in a unified environment lowers operational costs through proper staffing and coaching tools. 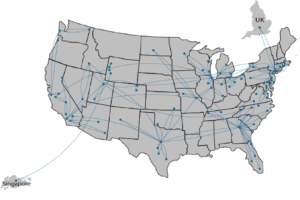 Native Cloud replaces premise-based data centers with cloud-based applications. Omni-Channel contact center combines voice, email, and chat communication in a unified environment providing seamless customer experience. Predictive Analytics-Based Routing enhances big data analysis to understand your customer’s journey, predict needs and identify the top performing agents to deliver optimal results. Find the right Contact Center solution for your business. Complete the form and a Veracity specialist will contact you to discuss the right contact center solution for your business.